Bariatric surgery has often been known as a cure for gastroesophageal reflux disease (GERD), especially if a patient has received a Roux-en-Y gastric bypass. 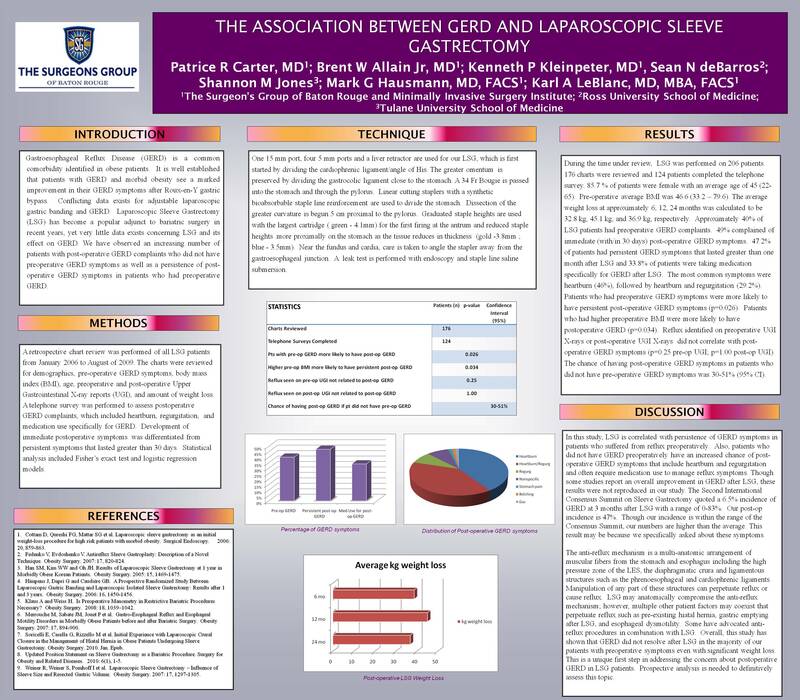 Yet with the increasing popularity of Laparoscopic Sleeve Gastrectomy (LSG), the prevalence of symptomatic GERD postoperatively seems to increase. Very little data is available on this topic. We hypothesize that symptomatic GERD increases after LSG. We also hypothesize that reflux seen on postoperative Upper Gastrointestinal Barium X-rays (UGI) is not associated with postoperative symptomatic GERD. A retrospective chart review was done of 62 patients who underwent LSG from January 2006 to August of 2009. Of these, 7 charts were incomplete. 55 charts were evaluated for age, preoperative body mass index (BMI), preoperative UGI results, preoperative GERD symptoms, postoperative UGI results, and postoperative GERD symptoms. GERD symptoms were defined as heartburn, use of proton pump inhibitors, and/or regurgitation not related to nausea or vomiting. 43 patients were surveyed via telephone questionnaire about symptoms of GERD. Logistic regression and estimates of the probability of symptoms were derived using the score interval approach for binary or nominal data. The average age of patients were 46 (range 23-65). Average BMI was 47.8 (range 35.6-75). There were 44 females and 11 males. Of the 43 phone respondents, 8 patients had GERD symptoms checked in their preoperative medical assessment. Of the 35 patients without preoperative GERD symptoms, 17 of those patients had postoperative GERD symptoms. The chance of having postoperative GERD symptoms if there were no preoperative GERD symptoms is between 33 – 64% (95% confidence interval). The chance that reflux seen on postoperative UGI X-rays will correlate with postoperative symptomatic GERD is between 36.7 – 65.4% (95% confidence interval). Age has no correlation with postoperative GERD symptoms. However, lower preoperative BMI’s are associated with increased postoperative GERD symptoms (p-value = 0.0295). LSG is associated with an increased risk of postoperative symptomatic GERD and reflux seen on postoperative Upper GI X-rays is correlated with postoperative GERD symptoms. Patients with a lower preoperative BMI may be at risk for developing postoperative GERD. This study isa unique first step to encourage further investigationinto the correlation between LSG and GERD.